Olympus TG-3 has been very popular on the market, serving as a relatively affordable and budget-friendly digital camera model. Coming from the Olympus’s Tough series, it also boasts a truly rugged and durable construction, which allows for a long-term usage. However, the manufacturer has released an update for the model, which is Olympus TG-4. Obviously, the new release is priced slightly higher than the old model. So, is there any improvement? Which is the model that holds the fullest value for the money? Let’s see the comparisons between Olympus TG-3 and Olympus TG-4 below! Quite interestingly, Olympus TG-4 still retains the same powerful image sensor of Olympus TG-3, which is a 16 MP 1/2.3” CMOS. The image sensor captures fine colors with excellent depth and dynamic range, creating such a vivid image. The resolution is excellent, allowing you to capture sharp, crisp, and detailed images. Both Olympus TG-3 and Olympus TG-4 are equipped with 25-100mm equivalent lenses that offer a maximum aperture range of F2-4.9. The maximum video quality is still 1920 x 1080 Full HD, and the recording quality is great for both casual and professional documentary. Both Olympus TG-3 and Olympus TG-4 are packed with features. They have a built-in sensor-shift image stabilization system and flash. They offer excellent manual exposure control, also various autofocus features such as face detection, focus bracketing, and focus stacking. And, needless to say, both have the ultra-rugged construction with environmental sealing. 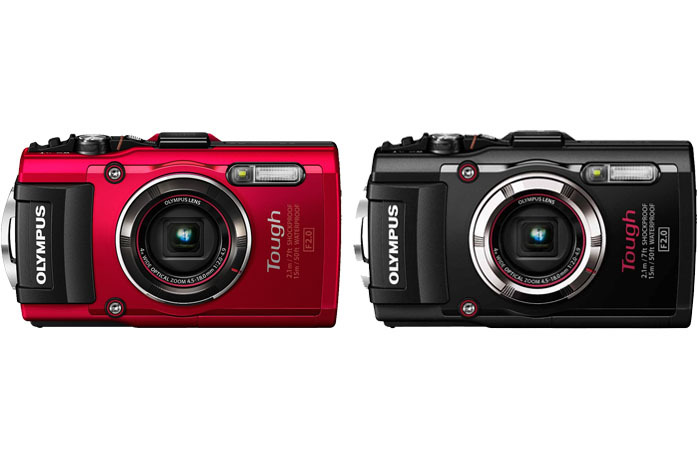 FYI, Olympus TG-860 vs. TG-4. You can say that Olympus TG-4 retains the great things of Olympus TG-3 while improving what can be improved. Actually, Olympus TG-3’s resolution is decent, but the noise reduction is somewhat heavy so that the subtlest details may seem to be smudged. Olympus TG-4 has countered this issue by introducing the RAW support. Olympus TG-4 now allows you to take RAW shots, which are more superior than the JPEG format. Olympus TG-4 also comes with a new feature of AE Bracketing now. The feature is very useful for difficult lighting conditions and HDR photography, as it allows you to capture multiple frames with different exposure values in order to generate a good contrast level in the final image. Last but not least, Olympus TG-4 has also been improved with a better battery life – the new model is able to deliver 380 shots per single charge, from the previous 330 shots. Having the RAW format is essential in order to get high image quality. Thus, Olympus TG-4 is indeed an excellent improvement from Olympus TG-3. While the RAW support alone can be a sufficient reason to get the model, the AE Bracketing is also very handy. Olympus TG-4 should be your way to go.